Citrus bud mite | Infonet Biovision Home. It is a tiny, worm-shaped, creamy white mite. It has only two pair of legs, and is hardly visibly without a magnifying glass. These mites occur in protected places such as under the bracts of buds. 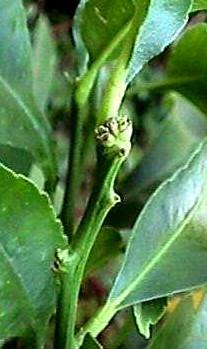 They attack the growing points of the twigs, causing malformation of the young leaves and flower buds. As a consequence, the growth of the trees is retarded. The fruit set can be seriously reduced and infested fruit may be malformed. Bud mites are more abundant during the hot season. Commonly found in developing and leaf buds. Damage under the bracts causes the death of the buds. Flower bud development is reduced, growth is retarded, branches become stunted and deformed, and rosette-shaped leaves are formed. The fruits, particularly in lemons are deformed. Almost all deformed fruits fall off at an early stage of development. Even light infestations may cause damage and control measures should be applied on time and regularly. Spots decrease the market value of the fruit and provide entry for fungal infection. Damage fruits loose moisture rapidly and do not keep well. Infestation on ripe fruits causes light yellow or silver discolouration. These mites attack all citrus species, but damage is usually worst in lemons. Damaged fruit could drop prematurely or assume abnormal shapes. The juice content of damaged fruit is significantly lower than that of normal fruit. The bud mites are not well controlled by natural enemies, and use of biopesticides is necessary for their management. Sulphur at a concentration of 2% controls both the rust and bud mites. However, sulphur kills also beneficial mites and may disrupt the natural control of other potential citrus pests. Sulphur must not be used at a temperature exceeding 30degC. A 4 week interval must be maintained between sulphur and oil sprays. No other pesticides or mixtures may be added to sulphur.